Students lined up outside the Student Union Ballroom and down the stairs waiting patiently for open mic night. 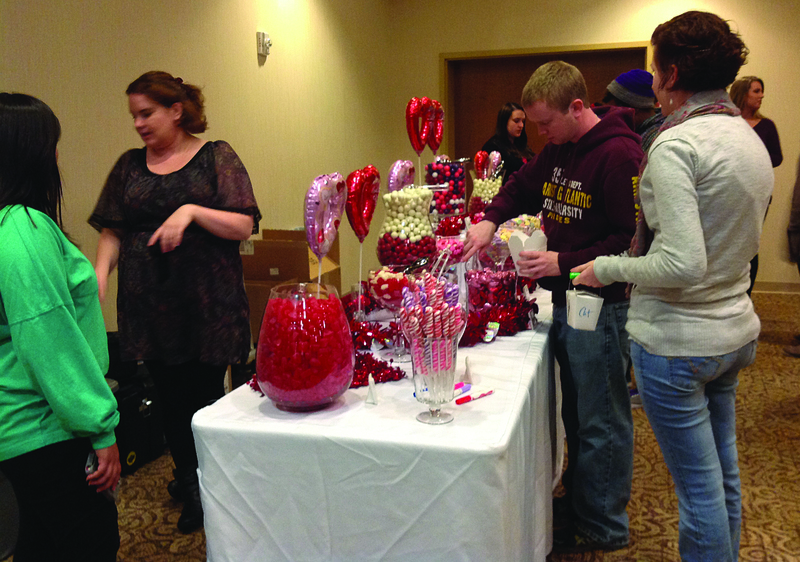 Feb. 10, The Valentine’s Day-themed event drew its largest crowd yet. The Student Government Organization provided an elaborate buffet of Valentine’s candy as well as snack foods including chicken fingers and wraps. The SGA executive board was astounded at the turnout as Student Union workers scrambled to set up additional seating. The audience attendance of open mic nights continue to grow as SGA invests more advertising, food, games and prizes into each event. Students continue to attend open mic nights for the stellar entertainment at each one. “I like hearing peers’ talents,” freshman business economics major Kirsten Glover said. The hosts kept the audience on their toes by asking trivia questions between acts. An intermission segment included a game of celebrity trivia which gave audience members the chance to win prizes. After the quick game, more acts took the stage. Students showcased a variety of talents, some showing off their vocal range and others performing spoken word poetry pieces. “It takes a lot of courage for them to get up there,” freshman theater major Jordanna Jones said. Some audience members seemed agitated at the abundance of noise coming from the audience while students were performing on stage. The addition of tables, food, and games to recent open mic nights seem to have changed the atmosphere from a quaint social gathering to a loud room full of commotion. “I felt it was very disrespectful and unprofessional,” Freshman civil engineering major Luke Peterson said. Emily, I love this so much – thank you for addressing how rude open mics can be! Call em out girl.